A recent car accident claimed the life of a 9-year-old Cohasset boy. According to 7NEWS, the child and his family were getting ready to go on their annual vacation to Maine when another vehicle spun out of control and slammed into them on a pier. The cause of the accident has not been determined, but the 61-year-old driver from New York was able to walk away from the accident unharmed. The child’s younger brother and his mother both went to the hospital. There has been no word whether the driver will face any charges. “She’s hurt pretty badly. She had broken bones in her pelvis area and she was undergoing surgery this morning,” said Chief Deputy Tim Carroll of the Knox County Sheriff’s Department. Our Boston auto accident lawyers understand these collisions make headlines each and every day. According to ABC40, another accident nearby sent five vehicle occupants to the hospital. In this accident, the vehicle flipped over as it attempted to exit the highway. Officers are also still trying to figure out the cause. While these two accidents were both single-car accidents, we see much worse out there — like the 5-car pileup on Interstate 391in Holyoke. According to The Republican, fire, police and ambulance personnel responded at the Exit 5 off-ramp. At least once person was injured in the crash, which was reported shortly after 6:30 a.m. According to accident reports, the cause was not immediately known. In the United States, the top three causes of motor vehicle accidents are drunk driving, speeding and distracted driving. And these are all factors that drivers can control. About 10 million people are involved in traffic accidents each year. And it’s these accidents that are the leading cause of death for teenagers across the U.S., according to the Centers for Disease Control and Prevention (CDC). But there are so many other factors that can significantly increase your risks for an accident. Some of these factors include weather conditions, inexperienced drivers, nighttime driving, design defects, road rage, drowsy driving, potholes, animal crossings and train tracks. When it comes to driving, it’s never been more important to just slow down and pay attention. 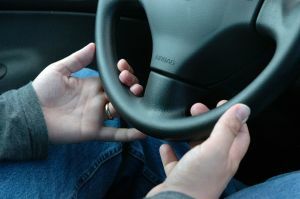 Too many times, drivers get too confident in their skills behind the wheel and throw safety concerns out the window. Your safety, your life and the lives of others all depend on you to make the right choices behind the wheel.